For standard oil filter heads with NPT thread. The standard metal tube oil transfer pipe and banjo bolt type block fitting is restrictive and drag inducing so reduces flow efficiencey. 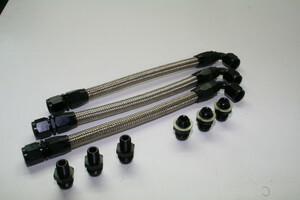 I developed this product after the dash 6 hose to maximise oil flow/drag reduction as far as is possible given the standard fitting sizes, Designed for performance road use and race use engines where no oil cooler is required (short track racing, hill-climbs and sprints). Hose is 0.50"/dash 8 bore. Post-1991 12A engine numbers have an odd-ball thread size in both block and filter head (11/16" UNF) so use CST3021.